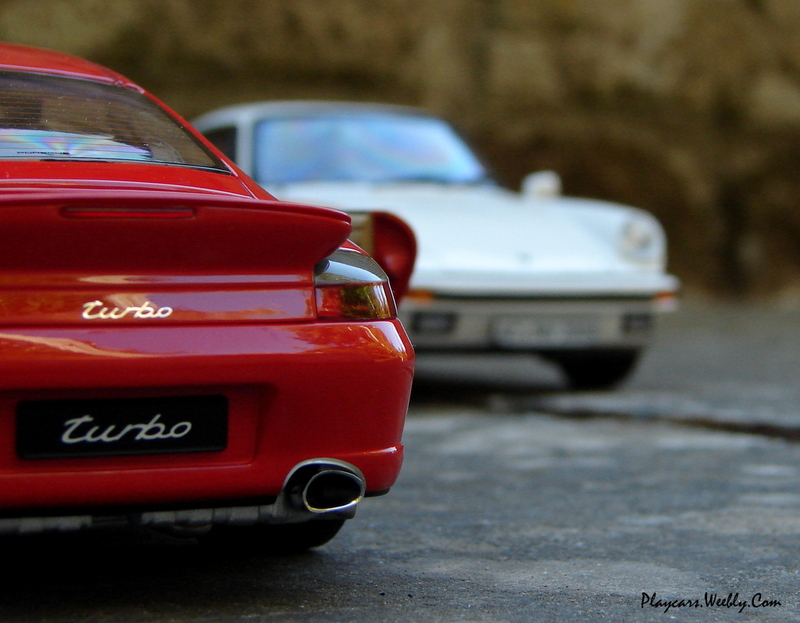 Putting together the Porsche name and „turbo” engineering the result could be only impressive. 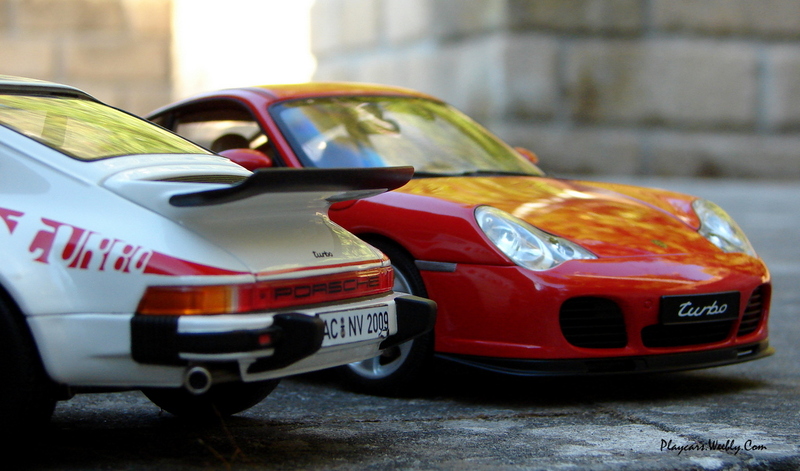 And if we are to speak on the same way about the sport cars and scale models, than you must admit that AutoArt makes the best reproductions in scale for the legendary Porsche. 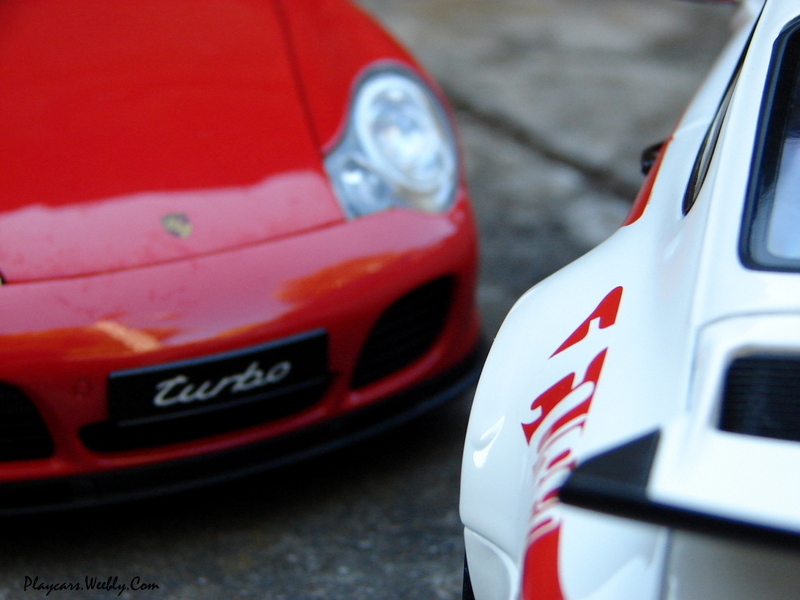 In this article I will take a closer look to the Porsche Carrera Turbo (996). 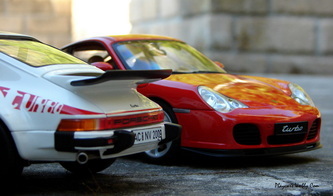 Is a long time since this model was released and isn’t very easy to have one now, especially if you are looking for the silver or „Turbo S” versions, for example. I’ve chose the red color for my model, just because fits the model very well and create a great contrast with the tan interior. The paint job is very well done, uniform, smooth and with a discrete brilliance. Isn’t a heavy model, because how they've usually done, the bumpers, sills, the lateral air intakes and engine grill are plastic made. A gorgeous detailing was applied on the lights level. Even if are attached with visible stubs, are very well hidden by the complex structure of the lens and the textured covers, giving the impression of a light bulb. 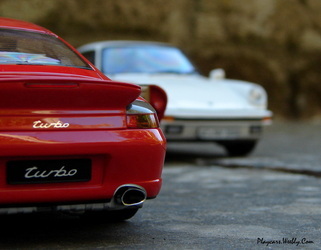 For the taillights the correct coloring scheme was respected. Not the same attention for the lateral signals which are individualized with a sticker and for the third stop lamp only painted. On the front lid the car’s logo is precisely done and tampo applied, as long as the rear lettering was replicated using a metallic photo etched part . 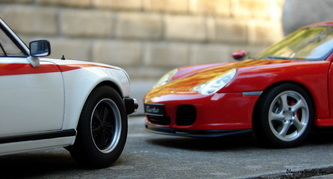 The model keeps the right profile and stance of the real car and the gaps are minimal. 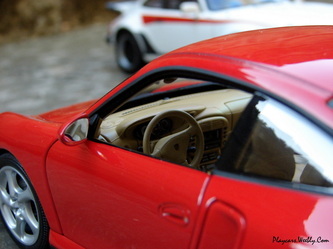 I would like some more attention in detailing the door handles, because are looking too much covered with paint. A good looking and qualitative chrome was applied on the final parts of the exhaust system. The grills included in the font and rear bumper are cut-trough, unfortunately not the same treatment was applied for the grill on the engine bonnet. About the wheels, only good things can be mentioned, because Aa already habituated us with great details and finishing on these parts. The rims are perfect, following the original turbine pallets design and even the studs were replicated with a 3D look. 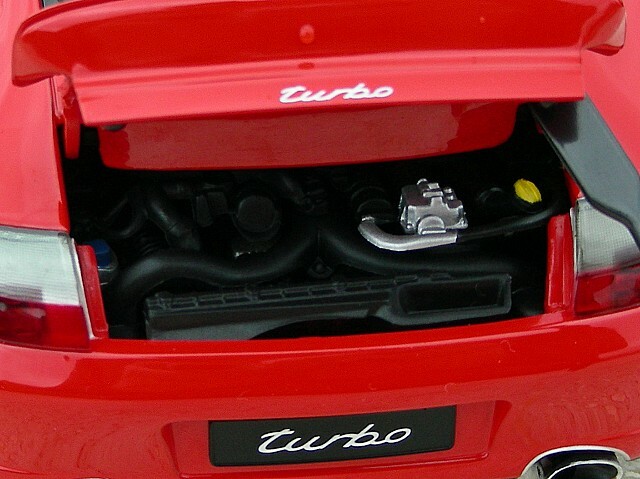 „Turbo” logo was applied in the center. Tires are feeling rubbery and soft, keeping the right profile, but without marks on their side-walls. 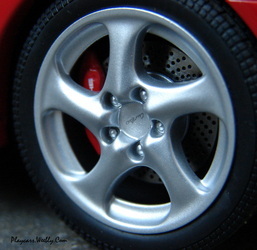 The brake system is looking very real, because a thin metallic cover was applied on the disk’s surface and finished to look like the used steel. In the same way are dimpled to fake crossed drill and the calipers were red painted and marked with the manufacturer name. Very good level of details here. 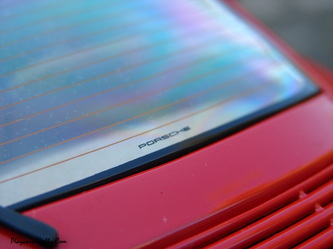 The rear window has the demister system replicated together with the "Porsche" inscription. No lateral windows and being an old model the dog-legs hinges are present on the doors, but for me this isn’t a problem at all. And just taking a look to the interior you’ll understand why I can easily pass away of this inconvenient. 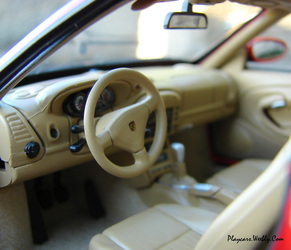 Beautiful detailed and carefully finished, but with some visible gaps, the cockpit have all the buttons and switches moulded and individually marked. The indicators are looking very nice being legible and in the same zone the steering wheel was perfectly modeled and branded in the middle with the car’s logo. On the seat surfaces the plastic was textured to give the leather impression. 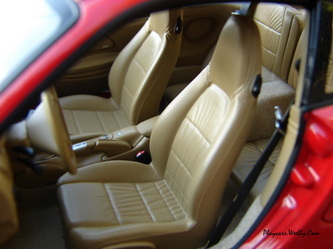 All the cockpit is carpeted and the seat belts are made of soft rubber and have individual buckles. Opening the front lid, the compartment reveals carpet, some plastic panels and a nice detailed container. 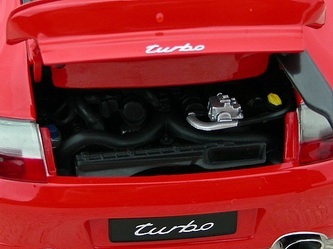 I don’t have many things to say about the engine bay, because is very poor detailed with discrete painting marks. They’ve tried to replicate some hoses, but are solid and moulded into the plastic base, which pretends to be the engine. 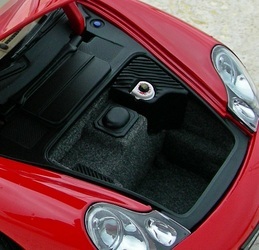 Underneath the engine and exhaust system can be observed, but again, with some lack of details. Whatever the view is ways better than on the superior part. I will end this review in a positive manner, because the model deserve this. It has its very good parts, but some lacks at the level of engine. Unfortunately this is valid for newer models, too. 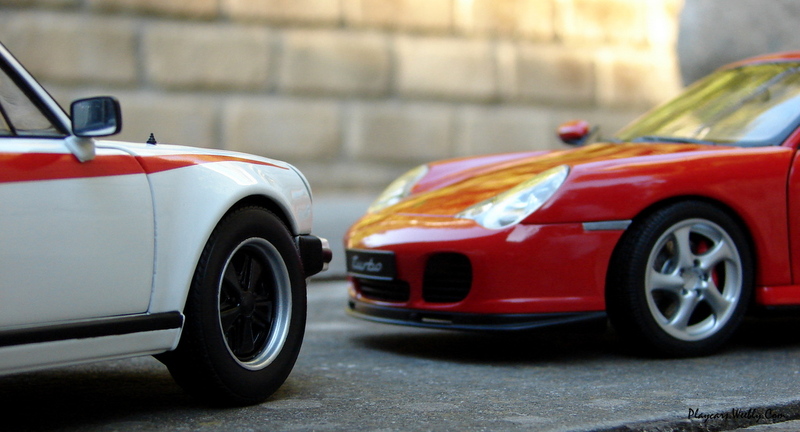 Is an important part of Porsche line-up and for sure a great model in my collection, too. I can’t ask more for its age and for the price I’ve paid some years back. Everything what remain to be done is to enjoy it.